LIFE is an aid project by more trees for afflicted area of the Pacific coast of Tohoku Earthquake. 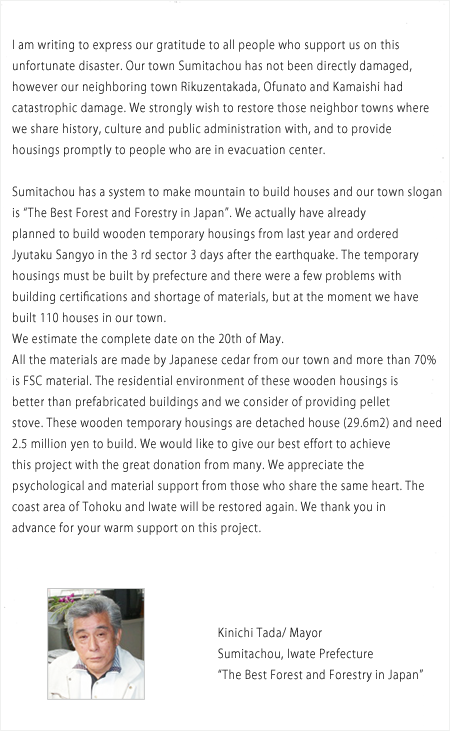 Our goal is to build temporary houses using domestic timbers with the people living in the area and also to generate new jobs and recruitment by using forest resources in Tohoku. Not only to support Tohoku from the outside, but we support from domestic approach to achieve area rehabilitation. More trees supports to build the networks to autonomy, companies and citizens to produce “work” and “ live”, and regenerate “LIFE”.